This article is about the fighter in the Super Smash Bros. series. For one of Luigi's precision weapons in Mario + Rabbids Kingdom Battle, see List of weapons in Mario + Rabbids Kingdom Battle § Ryu. Ryu is one of the central characters of Capcom's Street Fighter series, appearing in every game in the series since the first. He is a practitioner of a unique martial art known as Ansatsuken. He appears as a downloadable character in Super Smash Bros. for Nintendo 3DS / Wii U, making him the first downloadable character to be either a newcomer or a third-party character. Players who purchase him off the Nintendo eShop also get his Street Fighter II stage, Suzaku Castle. He is voiced by his voice actors for all versions of Street Fighter IV and Street Fighter V: Kyle Hebert in English, and Hiroki Takahashi in Japanese. Ryu walks onto the stage. Similar to Mario and like in the Street Fighter series, Ryu is an "all-around" character. 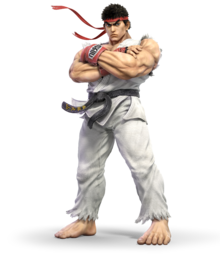 However, this is only in terms of basic attributes; unlike Mario and unlike in his home series, Ryu is designed to be a very difficult but rewarding character who relies on combos and dexterity, to highlight the differences between Super Smash Bros. and traditional fighting games. All of Ryu's attacks also originate from the Street Fighter series. Like in the original Street Fighter, the power of Ryu's attacks is dependent on how long the player holds down the attack buttons. His standard special is the Hadoken, his side special is the Tatsumaki Senpukyaku, his up special is the Shoryuken, and his down special is Focus Attack. By inputting the original Street Fighter button inputs for his special moves, they are stronger when executed. Ryu also has two Final Smash attacks, the only character in the series so far with this distinction. If used normally, the Final Smash is a Shinku Hadoken, which sends a larger Hadouken across the screen that can pull in fighters; if used next to an opponent, the Final Smash is a Shin Shoryuken, which is a more powerful Shoryuken. A number of Ryu's aesthetics also reference his series of origin. All of Ryu's attacks, when landed, play the corresponding sounds from Street Fighter II. Hitting him while shielding also plays a unique sound, and perfect shielding plays the "parry" sound from Street Fighter III: 3rd Strike. Finally, all of Ryu's alternate costumes are those from his appearance in Street Fighter II Turbo HD Remix. 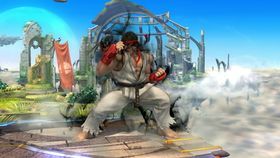 Ryu reappears in Super Smash Bros. Ultimate as part of the base game alongside the other DLC characters from the previous installment, this time as an unlockable character. 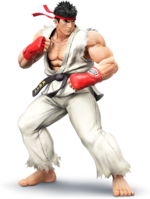 His appearance has been updated to reflect his design in Street Fighter V. In one-on-one matches, Ryu always faces his opponents, similar to his original games. In addition, Ryu's friend and rival, Ken Masters, appears as an Echo Fighter of Ryu. Unlike other Classic Mode routes, all of Ryu's rounds are Stamina battles to emulate the gameplay of the Street Fighter series, with both fighters starting with 150 HP and the opponents being based on Street Fighter characters. Additionally, the Bonus Game takes place partway through the route after Round 4 as opposed to Round 6, a reference to the single player modes in the Street Fighter series. Hadoken (波動拳, sometimes spelled Hadouken) is a trademark move appearing throughout the Street Fighter series, appearing as Ryu's standard special move. When used, Ryu thrusts his hands forward and launches a fireball across the screen; the exact speed, distance, and damage of the attack depends on how long the player holds down the button. Ryu can only launch one Hadoken at a time. By inputting the Street Fighter command for the Hadoken (down, down-forward, forward + any attack button), the player can launch a slightly larger and stronger Hadoken, though the speed at which it travels does not change. In addition, by inputting the command for Dhalsim's Yoga Flame move (tilt the control stick in a full semicircle rather than a quarter circle), the player can perform a Shakunetsu Hadoken (灼熱波動拳), which launches a red fireball that deals multiple hits of fire damage and explodes at the end, though the distance is once again unchanged. Tatsumaki Senpukyaku (竜巻旋風脚, shortened to Tatsumaki and sometimes referred to as Hurricane Kick) is one of Ryu's signature moves debuting in the original Street Fighter that appears as his side special move. Ryu performs a spinning kick, moving forward and a whirlwind surrounding his body. He spins only once if the special attack button is pressed and three times for up to three hits with increased power if the button is held. The Tatsumaki stops moving, but still kicks if Ryu reaches a ledge. 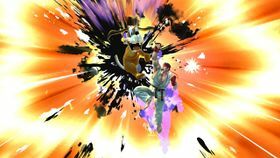 The move can also be used in the air, slowing Ryu's descent. By inputting the original Street Fighter inputs (down, down-back, back + any attack button), the move strengthens and travels farther. Shoryuken (昇龍拳) is one of Ryu's original special moves from the Street Fighter series appearing as his up special move. 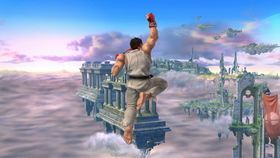 Ryu leaps into the air with an uppercut attack, dealing a single strike to any opponents in his path, though he is left helpless afterward. The damage dealt and height given the by the move are greater if the player holds down the button rather than just pressing it. If the player inputs the original Street Fighter controls for the Shoryuken (forward, down, down-forward + any attack button), the player can perform a stronger Shoryuken that makes Ryu invincible for the duration of the move and has no landing lag. Focus Attack (セービングアタック Sēbingu Atakku, "Saving Attack") is a move introduced in Street Fighter IV that every character in that game can use, which appears as Ryu's down special move. Ryu charges up a punch for as long as the special attack button is held down, ink surrounding him. Ryu is also given super armor for the duration of the attack, though it will only protect against one hit. A fully charged Focus Attack will briefly stun opponents that are hit. The player can also cancel the attack by double-tapping the control stick. 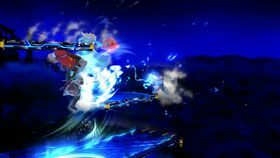 In addition, by tilting the control stick in the other direction while charging, the player can reverse the direction of the attack. Shinku Hadoken (真空波動拳) is one of the variants for Ryu's Final Smash, originally debuting as a Super Combo in Super Street Fighter II Turbo. This version of the Final Smash appears if used when there are no opponents directly in front of Ryu. Ryu fires off a larger Hadoken that has a vacuum effect on opponents, dealing multiple hits before knocking them away once it dissipates. The Shinku Hadoken is also capable of traveling through the stage. If the Final Smash is activated when Ryu is next to an opponent, the Final Smash becomes the Shin Shoryuken instead. Shin Shoryuken (真・昇龍拳) is a move from the Street Fighter series debuting as Ryu's second Super Art in Street Fighter III: New Generation, and appears as one of his two Final Smash attacks. This attack is used when the player uses Ryu's Final Smash with an opponent directly in front of him. Ryu traps opponents with a flash of light and deals three punches ending with a Shoryuken that deals more damage and knockback than his other Final Smash attack, the Shinku Hadoken. If there are no opponents directly in front of Ryu, then the Final Smash becomes the Shinku Hadoken instead. Arcade Street Fighter (1987) Ryu visits from the Street Fighter series! Ryu's fighting style is based on karate, but he's mixed in some other martial arts to make his own unique style. In Smash, he will perform either weak or strong attacks depending on if you press or hold down the buttons. His special attacks also have three power levels! Ryu makes his Super Smash Bros. debut! His fighting style is based on a form of karate, but he's mixed in some other martial arts to make his own unique style. Here his attacks can be weak or strong depending on whether you press or hold the buttons. Each of his specials have 3 levels of power using the same method. Arcade Street Fighter (1987) Ryu's Focus Attack move lets him withstand a blow and then counterattack. The longer you hold it, the longer your enemies will be stunned if you hit them. If it hits a standing enemy, the enemy will become defenseless. When that happens, cancel your Focus Attack and unleash a sick combo! Ryu's down special, Focus Attack, allows him to withstand a single attack and then unleash a counter. The longer you hold the button, the longer a standing enemy will be stunned if you hit them. An enemy in the air will fall slowly, defenceless. When that happens, cancel the Focus Attack and go for the knock-out! Use this attack when Ryu is far away from an enemy to unleash a Shinku Hadoken that penetrates through the stage. But if you use it when Ryu is close to an enemy, he’ll unleash a Shin Shoryuken uppercut attack. When it hits, Ryu will follow up with his other fist and launch the opponent up, up, and away! 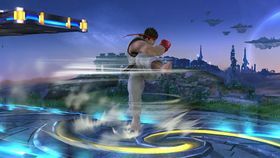 Ryu's Final Smash takes on two different forms depending on how close Ryu is to the enemy. If he's farther away, he'll use Shinku Hadoken, a move that pulls in any enemies nearby. If closer, he'll instead use Shin Shoryuken. He'll hit the enemy once with a powerful uppercut, then follow it up with the other fist to finish the job! The following dialogue applies also to Mewtwo, Lucas, Roy, Cloud, Corrin and Bayonetta; all DLC characters like Ryu. "The journey... has just begun." "Your range is one fist short!" Promotional poster drawn by AKIMAN. Ryū His Japanese name during his lifetime. In the very first Street Fighter game his Japanese name was 隆.
Lóng The Chinese equivalent for the term "ryū"; both "ryū" and "lóng", used as common nouns, mean "dragon" in their respective languages. Ryu's newcomer artwork is one of five to not feature Mario, the others being Little Mac, Palutena, Shulk, and Bayonetta. Ryu's newcomer artwork is actually a parody of a piece of promotional artwork for Street Fighter II. While Super Smash Bros. for Nintendo 3DS / Wii U is Ryu's first and only crossover appearance alongside any Mario characters apart from Bowser (as cameos in the film Wreck-It Ralph), he has appeared alongside other characters with playable, assist or boss roles in the Super Smash Bros. series (Sonic the Hedgehog, Mega Man and his variants, Pac-Man, Lucina, Chrom, Metal Face) in a number of other crossovers, such as the Marvel vs. Capcom and Project X Zone series. This page was last edited on January 21, 2019, at 00:38.